Old Formula One cars on bathroom / bedroom tiles. Homepage. This page: A set of ceramic household tiles depicting various Formula 1 cars of the late 1950s. These are the first household tiles to appear on the site, and could well be the last! They turned up at a car boot sale, and they depict various single-seater Formula 1 racing cars. Each measures approx 11cm x 11cm. My guess is that they date to the early 1960s, as they feature both front- and rear-engined Grand Prix racing cars. As well as on the bathroom / bedroom tiles shown below, I've seen some of these images reproduced on bedroom door name plaques (I had one as a child), and also on porcelain tankards, so they're probably still quite commonly found. If anyone has any more tiles in this series, I'd be interested to know which other cars are featured. Does anyone know who made the tiles, or who did the artwork that appears on them? Please click on the thumbnails to see larger versions of each image. 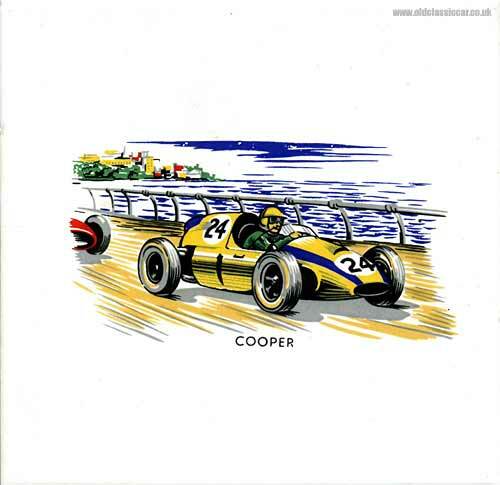 Car 24, a yellow rear-engined Cooper being hotly pursued by something Italian. 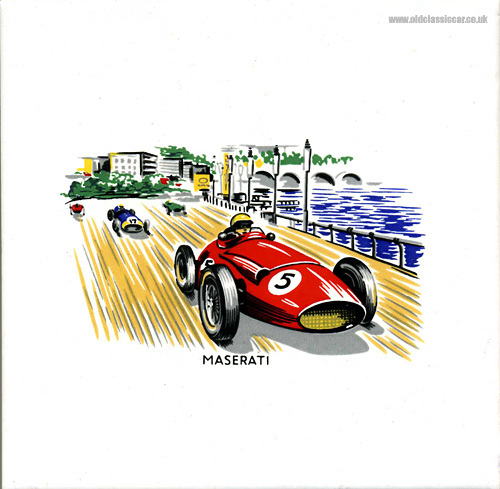 A sleek, late 1950s, Maserati 250F speeds by. The front-engined Aston-Martin Grand Prix car passes the pits. A Vanwall leads the field. 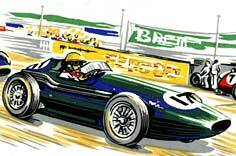 A BRM P25 leads from Car No.12 (Maserati). A front-engined Lotus 16 takes a lefthand bend. Return to the Motoring Collectables section for more items featuring old cars.